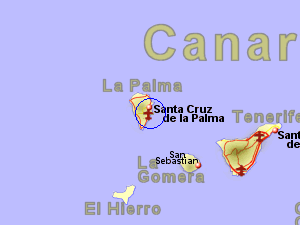 La Palma, one of the smaller and also one of the most westerly islands in the Canaries, benefits from the cooling effects of the north easterly Trade Winds bringing cooler air down from further north, together with the cooling effects of the Atlantic Ocean, tempering the summer temperatures to a level slightly below those of the southern coast of Spain. Yet in the winter months, the fact that La Palma is much further south, results in very mild temperatures, not far below those of summer. Occasionally in the summer, an easterly wind can bring hotter air from Africa, but if it happens, it usually only lasts for a few days. The winds from the north carry some moisture which mainly falls as rain in the north of the island as the air rises over the central high ground (upto 2,400m or 8,000ft). The south of the island is quite dry with virtually no rain falling through the summer months and very little the rest of year.